This is either really cool or kind of creepy. I'm in the latter group, but you have to give BMW props for taking cinema advertising to a new and rather interesting space. BMW took the afterimage effect to a new place where they quickly flashed a bright light during an in cinema commercial and then the commercial asks the audience to close its eyes. Those who closed their eyes saw the afterimage of "BMW". 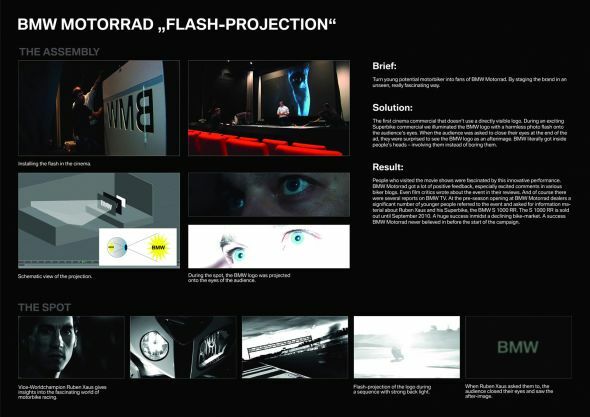 It's a pretty cool idea; though, it isn't something that is easily portable as the projection of the logo requires a full installation behind the movie theater's screen. So scale is an issue. Personally, I don't find it creepy. I'm impressed. Let's face it, marketing and media has already infiltrated our minds in various different ways, and at various different levels of impact. This is just another way to reach us. BMW is trying to make a different kind of impact on the consumer. Pretty stellar move. Question is...how much is it going to cost them to do this in movie theatres? The set-up, while simple, seems a bit pricey. It's not something people discuss today but back in the day in the 70's and I am sure earlier we used to talk about subliminal persuasion and wonder if TV was trying to get in our heads. I think this concept is neat. I think people could take away the wrong intent here. But yes I give them credit for doing something completely different. All right. That's fine looking video of BMW. The product of BMW are really amazing. The new invention from BMW and the addition of modern technology made it more modern in nature.